We are writing this letter of recommendation for the firm of Patrick T. Sheehan & Associates, Attorneys at Law. My wife and I incurred an Internal Revenue problem. We came to Patrick T. Sheehan & Associates for help and were introduced to one of their tax attorneys. From the beginning, the attorneys at Patrick T. Sheehan & Associates were highly professional, talked to us in legal language we could understand and resolved all of our problems. We were very pleased with the law firm and would recommend this firm to our friends. When they first came to us, our taxpayers, a husband and wife, believed that they filed their federal Form 1040 tax returns with the IRS for 2006 and all earlier years. They also believed that they had filed their tax returns for 2007 and all later years. Unfortunately, the IRS took the position that they had not filed their tax returns for 2004 and all later years. We worked with our taxpayers to cause the preparation of their unfiled federal Form 1040 tax returns, and the liability for the earlier years was substantial. There was also liability for the later years, but it was substantially smaller than the earlier years. 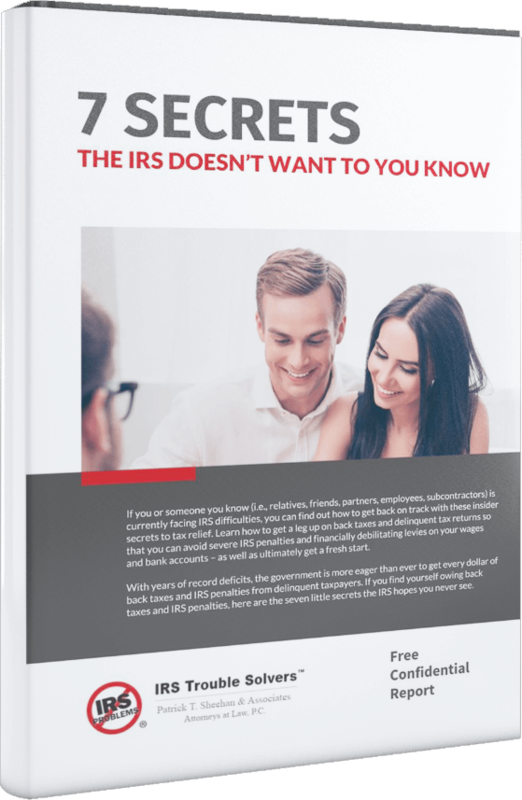 We discussed a little-known IRS policy with our taxpayers under which the IRS can choose to not demand the filing of certain tax returns because of their age. Because some our taxpayers’ tax returns appeared to meet this little-known IRS policy, our taxpayers chose to attempt to rely on this IRS policy and did not file the tax returns for the earlier years, the ones with substantial liability. Instead, we filed the tax returns that fell outside of the IRS policy and the IRS accepted those tax returns as filed. Although all taxpayers have a duty to file all tax returns that are required to be filed, and even though the IRS policy discussed above conflicts with the law in this regard, our taxpayers chose to attempt to rely on this IRS policy. Our taxpayers subsequently paid the smaller liability on the later tax returns in full and the IRS did not ask for the filing of the remaining unfilled tax returns.